Andy’s Appliance Repair is your go-to company to call for all things appliance repair related. We handle washer repair, dryer repair, freezer repair, ice maker repair, along with other common kitchen appliance repair needs. 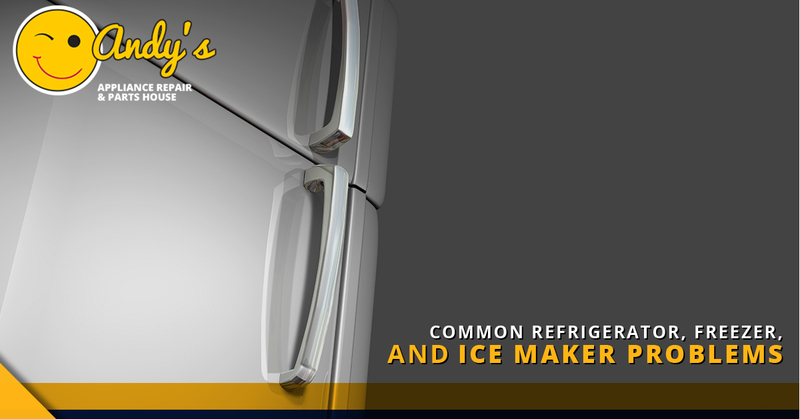 In today’s post, we will getting down into the nitty-gritty of common refrigerator, freezer, and ice maker problems. We will be identifying the problems themselves, and then address the typical techniques associated with fixing them. Before we get going, we would like to point out that we aren’t asking you to be experts and fix your own appliances. But, if this saves you a phone call and us a trip for a problem with an easy fix, then all the better! So read on if you are interested in educating yourself and becoming more of a handi-man around the house! Usually the issue here is that the ice maker has sprung a leak. Most people don’t realize that there is a shutoff valve, which is usually under the sink. If it’s not there, look in the basement, beneath the refrigerator. After you’ve done that, feel free to give us a call to take a more in-depth look at what is really going on with your ice maker and refrigerator. There is something under your fridge that is both a dispenser of heat and a collector of dust. It is called a condenser coil, or coils. In homes with an excess of dust or dander this can be a real issue. The easy refrigerator fix here is to simply clean the coils with a vacuum. And how about this for a pro tip; save yourself some time and effort by keeping further cleanings to a minimum. Use a section of old pantyhose or similar material to fit inside the vent panel, just beneath the door. That should help prevent dust and other common debris from ever getting to the coils in the first place. We see this freezer problem quite a bit. It could be the result of a leaking door gasket. The gasket’s purpose is to allow the cold air to consistently escape, which makes the refrigerator run more than it should, and produce a higher quotient of coolness in the freezer. You can check the gasket by putting a flashlight or emergency battery-powered light unit in the freezer itself, with the beam of light pointed at the door. Turn off your kitchen lights and take a look around the outside of the door. If there is any light leaking through, it is probably time to replace the gasket. We recommend calling us at Andy’s Appliance Repair just to be sure. And we have no problem ordering the freezer repair part, and installing it for you, all of course for a very fair price. The first thing to check here, and don’t get offended because it can happen to anybody, is to check and see if your ice maker is on or off. You might be in need of an LG fridge repair, a Sears refrigerator repair, or another one of many different name brands (which we all service at Andy’s Appliance Repair). The point is that you’ll need to check your use and care guide that came with the refrigerator. If your refrigerator was recently installed, remember to allow 24 hours for the refrigerator to be cool enough to begin making ice. Beyond that, there could be a number of issues here that typically require more seasoned hands to troubleshoot. This could be myriad of different issues going on here, so let’s start with the easy stuff first. Make sure the lights turn off when closing the door. Be sure to check and see that the gaskets are closing completely and aren’t torn at all. Make sure the evaporator fan in the freezer is functional, because that is the fan that blows cold air. An issue that has become more prevalent lately is the air damper not opening up to allow the cold air from the freezer to blow into the refrigerator. For years, air dampers were manually operated mechanisms, but now we have automatically controlled air dampers. Fun fact; if you are having Whirlpool refrigerator problems, they call their air damper a diffuser. To troubleshoot these refrigerator problems on your own, check the condenser tubing and condenser coils (again, dust and debris). Also make sure that the compressor itself is running smoothly, and specifically not making any clicking sounds. If you don’t know where the compressor is, it might be a good idea to call in your friendly Lincoln and Omaha appliance repair company! First thing is first; if you have recently installed your refrigerator and haven’t used the water dispenser at all yet, you will need to press the water dispenser lever down for 3 minutes, in order to get the water reservoir to completely fill up. That reservoir is usually found within the fresh food section. Whether you have a Frigidaire refrigerator, Whirlpool refrigerator, Samsung refrigerator, KitchenAid, GE refrigerator, Kenmore Elite refrigerator, or Maytag refrigerator, it usually takes around 1 second for every ounce of water to be dispensed. Anything significantly slower than that could be an issue, and is probably worth getting checked out. You might also have a clogged water filter. This may cause little to no water to come out of your dispenser. A water filter should be changed every 6 months on average, although individual manufacturers may recommend different timeframes based on their own brand’s technology. Once you have had the water filter replaced, test the dispenser by pressing it. If water comes out of your dispenser, then you have successfully diagnosed and fixed the refrigerator problem! Refrigerators aren’t the most complicated of appliances, and most handymen can troubleshoot issues with a basic understanding of kitchen appliance repair. But there are certain situations that are outside of the realm of even experienced men and women in the field. For example, the presence of toxic coolant which is under pressure is not a case where we can recommend to go poking around looking for a problem. Here are a few sure-fire situations where you should call us Andy’s Appliance Repair. To the last point, don’t feel badly! That’s why we exist in the first place. It isn’t your job to be refrigerator repair experts. Andy’s Appliance Repair is the company you call when you want the job done right, the first time, by a service company that respects both you and your property. If you are needing appliance repair of any kind, please don’t hesitate to call us.